Since September 2018, there has been a dramatic increase in militant attacks in Burkina Faso, now affecting 11 of the 13 regions. The majority of this activity targets security forces, local authorities, and schools. Militant groups have increasingly targeted the mining sector through theft, extortion, and active control over mines. However, security operations that close mines even temporarily are liable to create resentment and encourage militant recruitment. Jihadists exploit intercommunal tensions to drive recruitment, especially among the Fulani, instigating retaliatory cycles of violence that can create large death tolls and alienate the population from the government. As attacks continue to spread throughout the country, there is a growing threat to Burkina Faso’s southern neighbors, which will have to bolster their defensive efforts despite their own political challenges to prevent a spillover of violence. Avoid nonessential travel to outlying areas of Burkina Faso given the ongoing threat of militancy and violent crime, while avoiding all travel to Sahel, Est, Nord, and Boucle du Mouhoun regions due to the risk of attacks. Where previously there were about seven attacks per month in Burkina Faso, between September 2018 and February 2019, militants conducted an average of 34 attacks per month. Most were in Sahel, Est, Nord, and Boucle du Mouhoun regions, but these trends continue to spread toward the west and south, particularly in Centre-Nord, Hauts Bassins, and Cascades regions. The vast majority of jihadist activity targets security forces, local government authorities, and Western-style schools. This will remain the broad focus of militant groups as they solidify their areas of control in the north and continue to expand their geographical presence. Jihadist groups increasingly target the mining sector, with theft and extortion expected to remain significant especially in Sahel and Est regions given how profitable these attacks can be. At the same time, military escorts for mining companies have also given militants new opportunities to attack security forces and thus increases risks to civilian travelers. Foreign nationals have come under attack repeatedly over the past six months, with at least five incidents since September 2018 in which foreigners were abducted or killed. This threat will remain high in all remote areas of Burkina Faso, particularly in the northern and eastern regions, and along the borders of Mali and Niger. The dual role of “Koglweogo” self-defense militias, with some factions supporting the government while others cooperate with militants, creates another layer of insecurity in outlying regions and will continue to exacerbate the situation. Security forces have been shown to use violence against civilians both to deter them from collaborating with jihadist groups as well as punish them for doing so. Their heavy-handed measures will alienate the local population and hamper security efforts, as well as further drive jihadist recruitment. Militancy is expected to continue spreading throughout the rural areas of the country as jihadists grow entrenched in the north and east and mobilize toward the west and south. Moreover, there remains the possibility of a high-profile attack in Ouagadougou, as has been seen periodically. The spread of militancy has already reached Burkina Faso’s southern borders and has the potential to affect its neighbors Ivory Coast, Ghana, Togo, and Benin, and these countries may not be able to bolster their security sufficiently to prevent the spillover of violence. In December 2018, the government of Burkina Faso declared a state of emergency in 14 provinces across seven regions, including the Hauts-Bassins, Boucle du Mouhoun, Cascades, Centre-Est, Est, Nord, and Sahel regions. Over the past year, from February 2018 to February 2019, approximately 270 militant attacks were reported across Burkina Faso. Between February and August 2018, militants conducted around seven attacks per month. Between September 2018 and February 2019, militants conducted an average of 35 attacks per month. Ansarul Islam – The first jihadist group to be established in Burkina Faso, it was founded in November 2016 by the now-deceased Ibrahim Malam Dicko. Ansarul Islam remains largely based in the Djibo, Soum Province area, though the group has conducted attacks throughout Sahel and Nord Regions and remains highly active in these areas. Dicko was an ethnic Fulani but Ansarul Islam is not a solely ethnicity-based group, with Dicko using Islam to challenge local dynamics and hierarchies to bring different ethnicities and classes together. Ansarul Islam engages not only in militant attacks against the state and ideological targets but also common banditry. At the same time, it also functions as a self-defense group in certain areas to protect its supporters from banditry and intercommunal violence perpetrated by others. Jamaat Nusrat al-Islam waal Muslimeen (JNIM) – The al-Qaeda coalition formed in Mali in March 2017 including al-Qaeda in the Islamic Maghreb’s (AQIM) Sahara branch, Ansar Dine, al-Mourabitoun, and Macina Liberation Front under the leadership of Iyad Ag Ghaly. JNIM serves as a united front for its strategic and militant operations based in Mali, where it controls territory and conducts hundreds of attacks each year in the northern and central regions. Additionally, the group has carried out large-scale attacks in the capital cities of Burkina Faso, Mali, and Ivory Coast. Over the past year, JNIM has increasingly expanded its area of operations into Burkina Faso, at least into Sahel, Est, Centre-Est, Centre-Nord, Nord, and Boucle du Mouhoun regions. Islamic State in the Greater Sahara (ISGS) – Adnan Abu Walid al-Sahraoui pledged allegiance to the Islamic State on behalf of al-Mourabitoun in May 2015, though was subsequently ousted by rival leader Mokhtar Belmokhtar. Al-Sahraoui and ISGS later claimed responsibility for a number of attacks in Burkina Faso and Niger and was acknowledged by the Islamic State central organization in October 2016. ISGS has since expanded its area of operations, focusing on the border of Mali and Niger, particularly in the Ansongo Menaka Partial Wildlife Reserve, as well as along the Niger-Burkina Faso border. However, the group has retained a much smaller profile in terms of propaganda. Their most notable attack was the October 2017 ambush of a US special operations team near Tongo Tongo, Niger. Over the past six months, Burkina Faso has seen a dramatic shift in its security as the intensity as well as geographical scale of militant attacks has rapidly expanded. Where there was once several attacks per month, largely concentrated in Sahel and Nord regions, this has grown to an average of 34 security incidents per month being reported in at least 11 of the 13 regions. This threat was long present due to Burkina Faso’s proximity to Mali, in the midst of a civil war and prolonged jihadist insurgency. Former Burkinabe President Blaise Compaore was believed to have forged deals with Malian armed groups to prevent their entering Burkina Faso, though this would have ended with his ouster in 2014. Compaore’s resignation after a popular uprising was followed by a failed coup by the Presidential Security Regiment (RPS) in 2015. This period of political instability, as well as the disbanding of the RPS with other reforms, weakened the security apparatus to the point where criminality and militancy could grow. Ansarul Islam emerged as Burkina Faso’s first jihadist group when it conducted its earliest known attack against a military outpost in Sahel Region in December 2016. The insurgency continued to grow over the following year, mostly concentrated in Soum and Oudalan provinces. This came alongside a relationship with the Mali-based Jamaat Nusrat al-Islam waal Muslimeen (JNIM) al-Qaeda coalition, with the two groups likely working in tandem for some attacks both in Burkina Faso as well as in Mali. It is probable that this cooperation led to the evolution of Ansarul Islam’s tactics from small arms to the use of IEDs, which began in late 2017 and continued since. With these connections, Burkina Faso’s Sahel and Nord regions could function as an area for Malian jihadists to escape the pressure of local and international military operations inside of Mali while continuing to launch attacks targeting Mali. 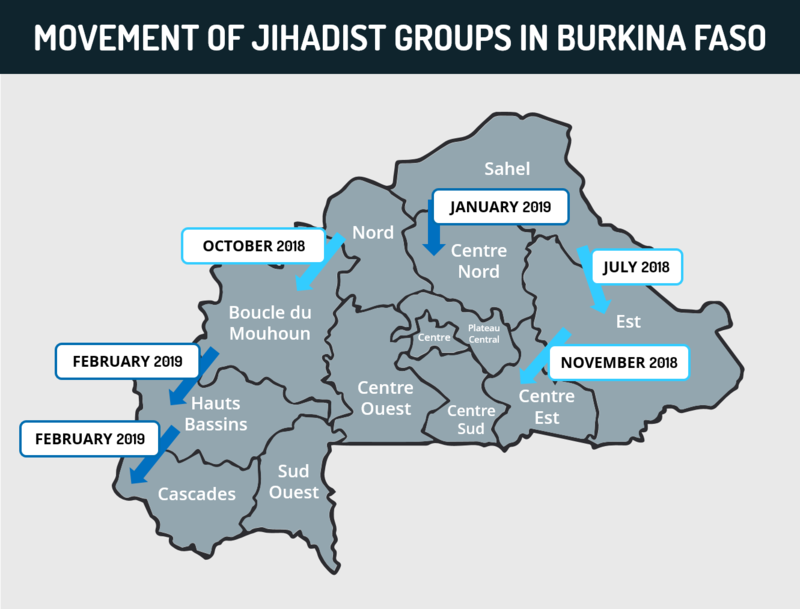 At the same time, the persistent but less frequent attacks on Burkinabe security forces in late 2017 and early 2018 helped to destabilize the border region, expanding the militants’ influence and allowing greater cross-border movement for jihadists that would come to facilitate JNIM’s movement southward into Burkina Faso by late 2018. While Ansarul Islam’s earliest attacks solely targeted security forces, this evolved into attacks against government officials, village leaders, religious clerics, and teachers who all represented the Burkinabe state and opposed jihadist ideology. Militants subsequently burned down schools for teaching French or Western-style education and forcibly gathered residents to preach more radical forms of Islam. In some areas, militants have also banned alcohol, prostitution, and smoking. In that sense, Ansarul Islam was able to establish a sufficient level of control over its area of operations to impose its ideology. Moreover, this pattern of influence and violence came to become a model for subsequent efforts in other parts of Burkina Faso, first in Est Region and beyond. In Est Region, reports of jihadist cells and camps being dismantled in March and April 2018 were early indicators of an expansion of militant activity. Attacks against security forces in Est began in July 2018, which then led to the targeting of local government officials and schools, with at least ten arson incidents against schools being reported and most schools closing down. 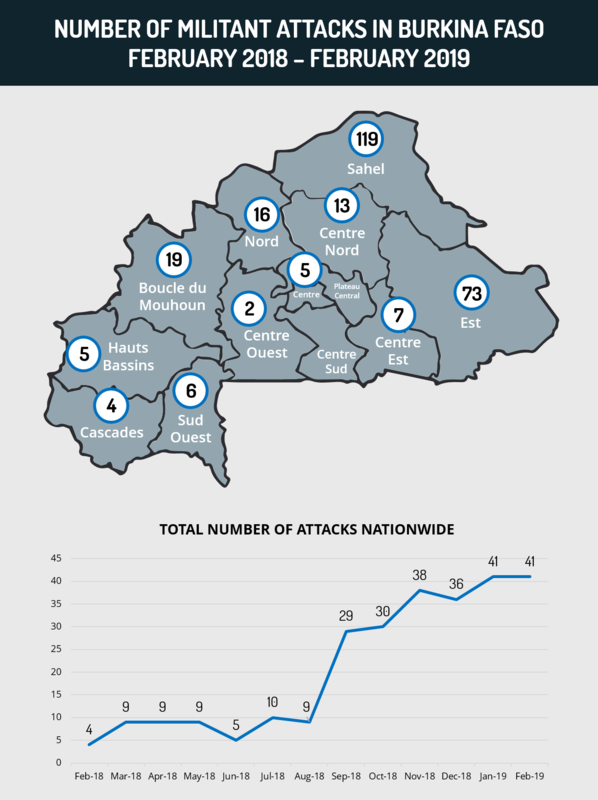 The number of attacks in Est and as a whole dramatically increased in September 2018, likely due to a concentrated effort by militants when it became clear that Burkinabe security forces were more vulnerable than they first appeared. This can also be seen as militants began this pattern anew in Boucle du Mouhoun Region only one month later, when the number of incidents jumped from five incidents along the border between January and September 2018 to 14 attacks between October and December 2018. In that sense, this strategy has been highly effective in destabilizing fairly large areas of rural Burkina Faso and imposing jihadist ideology. FORECAST: Using the precedent set first in Sahel and Nord, and then in Est and Boucle du Mouhoun, these patterns are expected to continue farther to the south and west. This has already begun in Centre-Nord, with early attacks against security forces in January, with the number of attacks increase to 12 reported in February and March, including those targeting village leaders and schools. Centre-Nord is thus expected to see an intensified level of jihadist activity in the coming months. At the same time, the early warning signs are likewise being seen in Hauts-Bassins and Cascades regions, which lie on Burkina Faso’s southernmost borders with Mali and Ivory Coast, and further attacks are expected in those regions as well. Over the past six months, militant activity has increasingly targeted the mining sector. This is especially important in the north and east where economic activity is mostly tied to mining or pastoralism. With mines in these areas being highly productive, militant groups have not only attacked assets for direct theft but also use violence to extort “protection” payments from facilities. Moreover, there are increasing indications that jihadists have taken control of mining sites. When several miners died in a landslide in Kompienga Province, Est Region in October 2018, the government was unable to access the affected area because the mine was under militant control. With mines creating employment and revenue, militant control over sites also provides them with the opportunity to establish themselves as the local authority, further embedding themselves into local communities and economies. FORECAST: It is likely that direct control over mines will remain fairly limited given that it would require more resources from the militants and is more likely to attract larger security responses. However, with overall activity targeting mines being highly lucrative for militants, extortion and theft is expected to continue, especially in the Sahel and Est regions. To some extent, this can also be viewed as an attack on the government, given that about 75 percent of Burkina Faso’s export revenue comes solely from gold mining. The theft of revenue, as well as the effect of the violence on mining companies’ decisions to invest in the country, could be substantially detrimental to the economy. Because of this, the government began providing military escorts for mining convoys. However, this also gave the militants new opportunities to attack security forces, with a number of convoys being targeted with IEDs and ambushes. Although mining employees have reportedly not been harmed in these incidents, this underscores the way in which the militants’ interest in attacking security forces can cause collateral damage to civilians. Foreign nationals have been specifically targeted in the context of attacks on mining facilities over the past six months. In September 2018, two foreign nationals were abducted after leaving a Ghanaian-owned gold mine in Soum Province, suspected to have been taken into Mali. Separately, in January, a foreign national with a Canadian-owned gold mining company was abducted and killed while visiting a mining site in Yagha Province. It is likely that both abductions were intended for ransom purposes with the latter incident being botched in some way. This is suggestive of the militants’ understanding that foreign-owned mining facilities are likely to have foreign nationals traveling to and from the site who can be kidnapped. FORECAST: Although both incidents took place in the Sahel Region, which remains the most volatile and least secure region of the country, this is reflective of an increasingly widespread instability that can affect travelers in many remote areas. Beyond the association with the mining industry, foreign nationals have come under attack repeatedly in rural areas of Burkina Faso over the past six months. This has included a Canadian and Italian disappearing in Hauts Bassins Region in December 2018, a Czech national killed in Centre-Est Region’s Koulpelogo Province on January 23, and a Spanish priest being killed by JNIM in Centre-Est’s Boulgou Province on February 15. Moreover, an Italian priest was abducted by ISGS in Niger’s Tillaberi Region only 15 km from the border in September 2018, after which he was taken back into Burkina Faso’s Est Region. Given the lack of uniformity, this has also made it clear that foreign nationals may be targeted with violence for their identity without the involvement of kidnapping. As abductions also serve a financial purpose, this is illustrative of the way in which militants use criminality to support their operations. FORECAST: It is increasingly clear that militants deliberately target foreign nationals when they become aware of their presence for the purposes of ransoms as well as international attention and propaganda, and these attacks are expected to continue in rural areas in the foreseeable future. Another symptom of the poor presence of the state in many rural areas has been the development of “Koglweogo” self-defense militias, which operate as localized security organizations across the country. At times, they are supported by local authorities, either openly or tacitly, though there are areas in which they operate fully independently from the government. The latter dynamic could be seen during the February 15 JNIM attack on a customs post in Boulgou Province during which Koglweogo militia arrived but were asked to leave by militants and evidently did so because the target of the attack was security personnel and not civilians. That the militants did not engage with the Koglweogo and let them go safely illustrates the clarity of the jihadists’ objectives in attacking security forces, but also suggests that self-defense militias in parts of the country are willing to cooperate with or allow militant operations so long as it targets the government rather than civilians. As Koglweogo militias operate independently of one another rather than as a unified network, there are other instances of the self-defense groups confronting militants. On January 1, militants assassinated the village chief of Yirgou in Centre-Nord Region’s Sanmatenga Province, a common type of attack against local authorities. In retaliation, the local Koglweogo militia killed at least 47 ethnic Fulanis in Yirgou and its environs. In that sense, the dual role played by self-defense militias adds another layer of instability as additional active armed groups in outlying regions of the country, and ones that not only retaliate against jihadists but can perpetrate abuses against civilians that further drive jihadist recruitment. That the Koglweogo militia retaliated against the ethnic Fulani population, in that case, is illustrative of another social and ethnic dynamic in the region, one that mirrors the situation in the neighboring Mali’s Mopti Region. Fulani pastoralist communities often conflict with farming communities, with Fulanis viewing themselves as marginalized by the government while other ethnic groups perceive Fulanis to be in collaboration with jihadists as both JNIM and Ansarul Islam have heavily Fulani factions. This intercommunal violence has made Fulanis further susceptible to recruitment by militant groups. In this context, jihadist groups have deliberately instigated attacks against other communities in anticipation of retaliatory attacks against Fulanis, which would then drive Fulanis closer to the militants. As seen by the incident in Yirgou, this can create high death tolls even within a single day. JNIM’s use of ethnic violence as part of its strategy for recruitment and mobilization has been highlighted in its propaganda as well. In November 2018, JNIM released a video featuring Macina Brigade leader Amadou Kouffa, who was preaching in Pulaar, the language of the Fulani people. This was meant to appeal to the broad Fulani audience across the region, which he made clear by calling upon Fulanis to mobilize for the jihadist cause, not only in Mali but also in Burkina Faso, Ivory Coast, Senegal, Guinea, Ghana, Niger, Nigeria, and Cameroon. To this point, JNIM has sought to capitalize on their successes in recruiting Fulanis amid these intercommunal conflicts. This not only aims to mobilize Fulanis for jihadist effots but speaks to JNIM’s wider regional goals in terms of expanding its influence throughout West Africa. 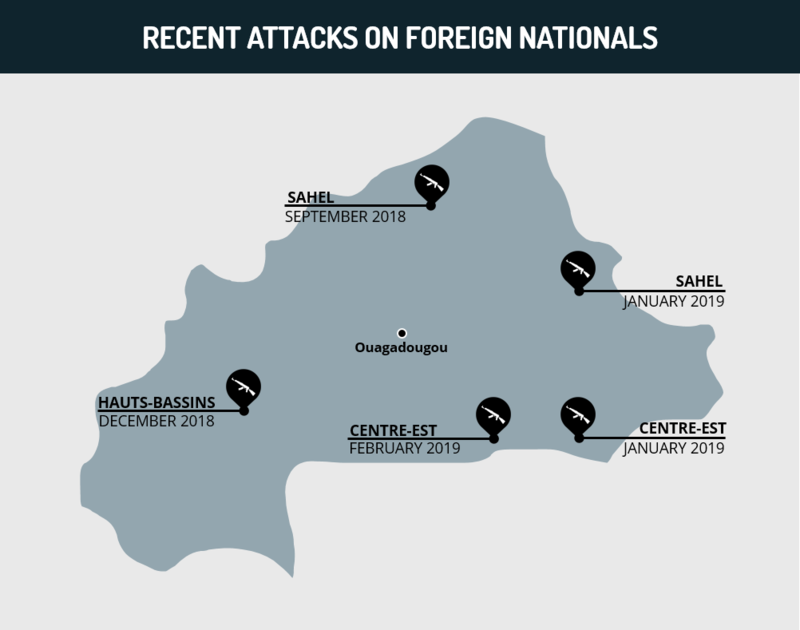 As attacks have multiplied across the country, security forces have consequently launched a number of campaigns targeting militants in Sahel, Est, Centre-Est, Nord, and Boucle du Mouhoun regions, with at least 17 operations reported since September 2018. While these may have been effective to some degree, the intensified response has also exposed Burkinabe security forces’ indiscipline and overall lack of capabilities. This was exemplified by the military’s claim to have killed 146 militants in a security operation in Loroum Province, Nord Region and Kossi Province, Boucle du Mouhoun Region on February 4. Human rights organizations later documented evidence that the victims were largely civilians who had been killed while asleep, with no indication that they were linked to militants. This aligns with repeated reports of security forces carrying out extrajudicial killings and arbitrarily detaining locals. The claim to have killed such a large number of militants was likely meant simply for government propaganda to portray the military as successful. However, reports have shown security forces to use violence against civilians for the purpose of deterring them from collaborating with militants as well as to punish them for supporting any militant groups. Such behavior has the dual effect of alienating local populations, which then hampers security forces’ efforts to collect intelligence or otherwise utilize the cooperation of local residents, as well as further driving jihadist recruitment. This additionally overlaps with existing ethnic dynamics, with security operations in heavily Fulani areas particularly causing resentment and motivating local collaboration with jihadist groups, which portray themselves as defenders of the Fulani. FORECAST: In the absence of accountability for security forces, as well as the continued proliferation of militant attacks like to create similar security responses, this cycle is expected to continue, with further abuses against civilians pushing further cooperation between locals and militants. Other government efforts also risk alienating the population in separate ways. In recognition of the role that mining facilities can play for jihadists, new measures were launched to conduct security operations in and around these sites. The Governor of Est Region’s March 20 announcement that all mining sites in the entire region would be shut down, followed by the High Commissioner of Yagha Province in Sahel Region announcing the same on March 22, suggests a deliberate effort to clear these crucial economic sites of militants. FORECAST: However, the full closure of these mines will likely impact the local economy, as they provide a significant amount of employment for thousands of local residents. Removing their source of employment is liable to create resentment toward the government as well as increase the susceptibility of locals to joining jihadist groups over discontent as well as a financial incentive. In addition, there has been increased French involvement in Burkina Faso in recent months. France has periodically supported Burkinabe security forces in recent years, with the bulk of Operation “Barkhane” focused on combating militancy and crime in Mali but operating throughout the region, including in Niger and Chad. This growing French involvement has largely taken the form of air operations, with French aircraft supporting Burkinabe forces in Est Region in October 2018 and in Sahel Region in January, though there have also been sporadic reports of French ground forces in Burkina Faso close to the border of Mali. FORECAST: French air support is likely to increase in the coming months, particularly in light of Burkina Faso’s air force having few aircraft and generally inexperienced pilots and crew. More broadly, as militancy continues to spread throughout much of Burkina Faso, including incidents along the borders of Ivory Coast, Ghana, Togo, and Benin, France will likely be additionally motivated to assist in a large-scale effort to prevent the destabilization of the wider region. 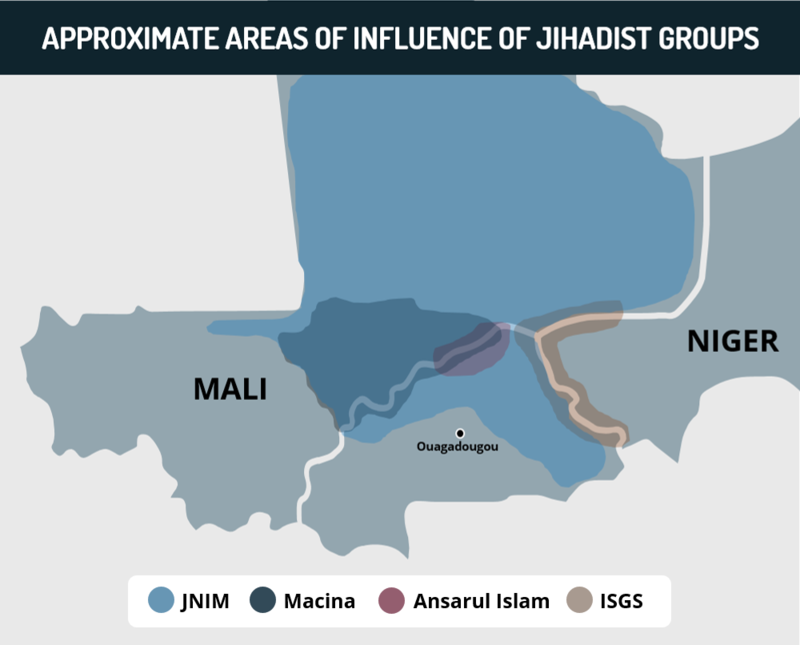 As has been seen with JNIM’s activity in Mali, it is likely that militant groups will seek to cement their gains in Burkina Faso while also keeping an eye toward steady expansion. FORECAST: This will mean that the bulk of JNIM and Ansarul Islam’s attacks will remain in Sahel, Nord, and Est regions to solidify their grip on those regions, with individuals or facilities linked to security forces and the government being the primary target. At the same time, the pace of attacks in other areas will likely be continuous if somewhat less frequent, with Boucle du Mouhoun, Centre-Nord, and Centre-Est the most prominent areas of targeted expansion over the coming weeks and months, with Hauts Bassins and Cascades likely to be a longer-term goal. This large geographical focus is somewhat ambitious but is likely to be effective given that Burkinabe security forces lack a comprehensive strategy or the capabilities necessary to secure much of these regions. Even if international forces increase their intervention, it is likely that Burkina Faso will increasingly see a scenario similar to Mali’s, in which some regions of the country are within jihadist areas of control while the government is only able to secure a wider zone in the vicinity of Ouagadougou and Bobo-Dioulasso. FORECAST: This will necessarily increase the threat against Ouagadougou as well. The capital city has periodically been the target of large-scale militant attacks, with JNIM and its constituent groups conducting attacks against government targets, hotels, and restaurants in Ouagadougou in March 2018, August 2017, and January 2016. Moreover, there have been other intermittent reports of security forces foiling attacks in Ouagadougou, such as in December 2018 and May 2018, suggesting that this aim remains a priority for militants in the region even as the insurgency intensifies in the rural areas of Burkina Faso. There is continued evidence of some militant presence operating in Ouagadougou and an attack against a Western or high-profile target remains possible, even as Burkinabe and French intelligence mobilize particularly to prevent it. As militant groups strengthen their grip on the outlying regions of Burkina Faso, this will also increasingly affect the security posture of the countries on its borders. In addition to heavy activity by JNIM and ISGS along the border with Niger, JNIM attacks have already been reported along the borders of Ivory Coast, Ghana, Togo, and Benin. Further movement into those countries would adhere to the wider vision of jihadist groups that seek to spread their influence throughout the region. FORECAST: Given the speed with which militancy has spread to the southern border, these neighboring countries are expected to bolster their security presence to the degree that they are able. While all four countries are generally stronger than Burkina Faso at this point, political instability or unrest in countries such as Togo and Ivory Coast may affect their ability to deploy enough forces to secure their northern borders. Accordingly, this heightens the potential for militancy to spill over into these countries, which would likely be in the form of small-scale attacks against security forces relatively close to Burkina Faso. With that said, this is likely to be a much more limited threat and part of a longer-term effort with the focus on Burkina Faso as conditions continue to deteriorate across the country. Travel to Ouagadougou and Bobo-Dioulasso may continue while adhering to stringent security precautions regarding crime and potential militancy. Avoid all travel to areas along the border with Mali and Niger given the threat of cross-border militancy and violent crime, including abductions. At least 1,980 people have been killed in intercommunal clashes between Fulani herdsmen and local farming communities across the Middle Belt Region, particularly in Adamawa, Benue, Kaduna, Plateau, and Taraba states, during the first half of 2018. This has led several of these states to implement “Anti-Open Grazing Laws” to restrict Fulani herders’ movement, further aggravating the conflict. The conflict is multifaceted, making it one of the biggest challenges in Nigeria, not only in terms of security but for the social and national cohesion of the country. Due to the effects of climate change, the conflict has worsened, with herders have been pushed southward for longer periods of time, creating tensions with farming communities over scarce resources. The lack of political will on the federal level to provide real solutions has further widened ethnic and religious divisions across Nigeria. President Muhammadu Buhari’s weak response and inability to tackle the country’s security challenges has led to some of his long-time allies abandoning the ruling All Progressive Congress (APC) to form the Reformed – All Progressive Congress (R-APC), where they intend to present a joint candidate with the opposition People’s Democratic Party (PDP). Given President Buhari’s weak political leverage, and his likely unwillingness to upset his northern grassroots supporters, the federal government is not expected to implement drastic policies to change the situation on the ground in the near future, and the conflict is likely to persist at a high pace. We advise against all nonessential travel to outlying areas of the Middle Belt Region due to frequent intercommunal clashes involving Fulani herdsmen. Several large-scale clashes and ambushes against villages have taken place across the Middle Belt Region over the last month including the killing of at least 86 people in clashes across several Local Government Areas (LGAs) of Plateau State on June 23. Likewise, 73 were killed in the border areas of Adamawa and Taraba states and another 50 in Taraba State on July 9 and 13 respectively. At least 500 farmers have been killed, including 17 parishioners and two priests in a church, by suspected Fulani herdsmen across Benue State since the beginning of 2018. Likewise, tens of thousands of people have been displaced, with their houses burnt amid the violence between herdsmen and farmers in the states that implemented an “Anti-Open Grazing Law” in late 2017. 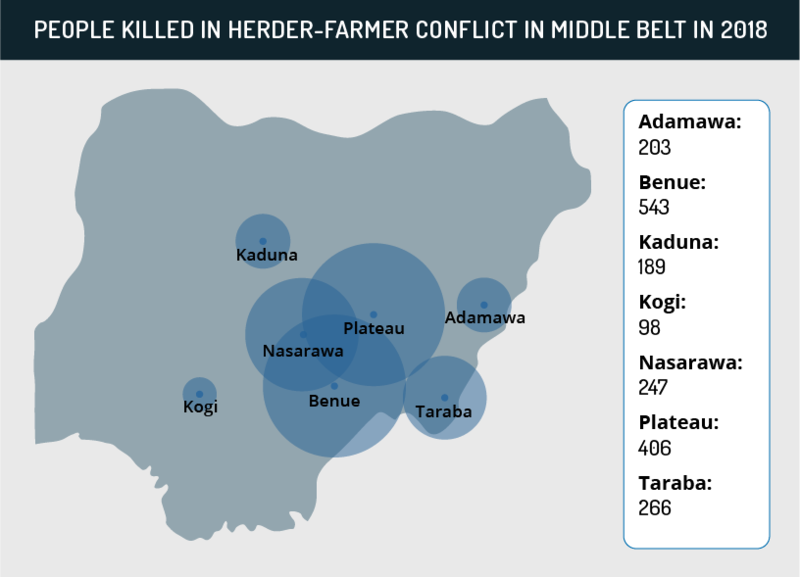 Overall, at least 1,980 people have been killed in intercommunal clashes between Fulani herdsmen and local farming communities across the Middle Belt Region, particularly in Adamawa, Benue, Kaduna, Plateau, and Taraba states, during the first half of 2018. Security forces dispersed hundreds of Christian farmers protesting in front of Plateau’s Government House on June 27, denouncing the violence against their communities. On July 10, 37 opposition parties including the People’s Democratic Party (PDP) and a splinter faction of the ruling All Progressives Congress (APC), the Reformed – All Progressives Congress (R-APC), agreed to present a sole candidate for the upcoming 2019 presidential elections in order to oust President Muhammadu Buhari. While nomadic pastoralism is a phenomenon that has decreased considerably over the last few decades, it remains a common way of life among certain populations in Nigeria, particularly for about 20 percent of the 7.6 million ethnic Fulani in northern and central Nigeria. During the dry season in northern Nigeria, Fulani move south through traditional grazing paths seeking additional fertile land for their cattle. As a consequence, nomadic herders often compete for limited resources, such as water, with farmers of these areas, which has been a source of continued clashes between the communities. Given the lack of security infrastructure in Nigeria’s rural areas, coupled with the intercommunal nature of the tensions, these clashes are often cyclical, where one attack by one community is likely to lead to a retaliatory raid by the other and vice versa. Nonetheless, traditionally, this violence did not catch the public and international spotlight, as they often resulted in minor death tolls given the employment of mostly cold weapons by both warring parties. Over the last few years, the death tolls associated with these clashes have exponentially increased. This is partially due to the massive proliferation of weapons that have flooded Nigeria as well as other sub-Saharan African countries, mostly originating from Libya following the ousting of Muammar Gaddafi and the country’s collapse. Thus, intercommunal clashes that were previously fought with cold weapons and hunting rifles now involve heavier weaponry by both migrating herders and vigilante groups established by farming communities. For example, in 2014, at least 1,229 people were killed in comparison to 63 in 2013. Even though intercommunal clashes between pastoralist and Muslim farming communities do take place across northern Nigeria as well as in additional West African countries such as Niger and Mali, the religious aspect of the divide in Nigeria does aggravate the animosity between the parties. The vast majority of Fulani herdsmen are Muslim while farmers in Nigeria’s Middle Belt Region are largely Christian, a situation that fuels suspicions and adds an additional layer of complexity to conflict resolution. Ethnic and religious divides have long been one of the main fault lines evidenced across Nigeria, which is emboldened by the deep differences between the communities even at a political level. As such, while religion is not the main driver for the clashes, it certainly worsens the conflict. The conflict between Fulani herdsmen and farmers is multifaceted, making it one of the biggest challenges in Nigeria, not only in terms of security but for the social and national cohesion of the country. Over recent years, this type of violence has surpassed the Boko Haram insurgency as the deadliest source of conflict affecting Nigeria. Although Boko Haram receives most of the global spotlight, intercommunal clashes have left more than 60,000 dead since 2001, in comparison with the 17,000 killed by Boko Haram militancy. The conflict has worsened for several reasons, with the greatest determinant being the growing scarcity of resources available. Herders traditionally migrated southward, seeking grazing lands and water for their cattle during the dry season. However, due to the effects of climate change, droughts and increasing desertification affecting northern and central Nigeria have pushed herders south for longer periods of time. In recent years, herders have also begun to migrate to southern Nigeria, often deviating from the Middle Belt, which makes them encounter communities not accustomed to their dynamics and makes tensions even more acute. The effects of climate change are also exacerbated by the country’s explosive population growth, which has turned Nigeria into the most populous country in Africa with close to 200 million people. This has led to the subsequent growth of urban centers as well as an exponential increase in cultivated lands both by local farmers and agro-industries. These farms have encroached upon traditional grazing routes across the Middle Belt used by herdsmen, which has intensified their grievances as they cannot find high-quality grazing lands for their cattle. In previous eras, these conflicts could be managed or mitigated by traditional rulers in rural Nigeria, who had once filled the vacuum of power left by the government in rural areas. However, this role has gradually eroded as their relevance has decreased, fueled both by modernization and the emergence of local political figures, who often attempt to create a system of patronage with local communities for their own purposes. Even as said politicians bid for further government presence in their constituencies, the Nigerian state presence across rural areas remains weak, thus not entirely filling the vacuum left by those traditional rulers. This ultimately emboldens the perpetuation of the violence between pastoralist and locals with little oversight. In tandem, the lack of political will on the federal level to provide real solutions to the violence has exacerbated grievances amongst locals and further widened ethnic and religious divisions. In particular, President Muhammadu Buhari’s weak response has been widely perceived as biased in favor of Fulani herdsmen, mainly because Buhari is a Fulani himself. Neither the president nor the government have criticized or condemned the Miyetti Allah Cattle Breeders Association of Nigeria (MACBAN), the most influential umbrella group advocating for Fulani herdsmen, for its inaction in ending the violence. This perceived soft stance comes in stark contrast to the federal government’s response toward other groups it views as disruptive, such as the Islamic Movement of Nigeria (IMN) and the Indigenous People of Biafra (IPOB), which face harsh crackdowns and military action. On the other hand, a broad spectrum of the Fulani populace in central and southern Nigeria have their own concerns, as many have felt stigmatized amid the rampant violence, which further alienates their youth and subsequently makes them lose confidence in the federal government. FORECAST: As such, regardless of ethnic and religious affiliation, the ongoing intercommunal violence and the government’s lack of initiative toward solving the crisis is expected to have an acute political backlash, particularly as the 2019 presidential elections draw nearer. On July 4, citing Buhari’s inability to tackle the country’s security challenges, including the violence in the Middle Belt Region, long-time allies of President Buhari abandoned the ruling All Progressive Congress (APC) and formed the Reformed-All Progressive Congress (R-APC). As of the time of writing, the R-APC has already secured the support of 60 APC congressmen and 30 APC senators, while announcing their intention to present a joint candidate with the opposition People’s Democratic Party (PDP), among other political forces, with the sole purpose of removing Buhari from office. On a local level, several states across the Middle Belt Region, including Benue and Taraba states, have implemented anti-grazing laws in a bid to answer their constituents’ complaints and the lack of decisive action on a federal level. These laws either forbid or severely restrict the movement and use of land by Fulani herdsmen in those states, thus increasing the animosity of Fulanis toward state authorities as well as local communities. FORECAST: As such, and considering the increasing frustration amongst local farmers, additional states are likely to consider the implementation of similar anti-open grazing laws, further fueling the conflict. Several demonstrations by Fulani have taken place, as evidenced in Taraba state capital, Jalingo, in 2017, with MACBAN harshly criticizing what they perceived as the blatant stigmatization of their community. In turn, feeling emboldened by said laws, local communities have also taken a much more hardline stance vis-a-vis Fulani communities in their states, even attacking settlements of ethnic Fulani not engaged in herding, thus further aggravating the conflict. FORECAST: Given the multifaceted character of the conflict, where deep and entrenched religious and ethnic divisions within Nigerian society further fuel a primarily resource-driven conflict, the violence is expected to continue unabated across the Middle Belt. Thus it will continue to represent the main source of violence in the country over the coming months. In this sense, and bearing in mind President Buhari’s weak political leverage and his likely unwillingness to upset his northern grassroots supporters, the federal government is not expected to implement drastic policies to change the situation on the ground. By the same token, and considering the approaching presidential election, even if the government would be willing to implement serious measures, it lacks the political support to provide a multilayered solution that would ease tensions between the warring communities. Travel to Abuja, Lagos, and Port Harcourt may continue while maintaining heightened vigilance and following stringent security protocols regarding criminal and security threats. Hey Buddy!, I found this information for you: "Intercommunal clashes in Middle Belt Region grow to be main source of violence in country – Nigeria Analysis". Here is the website link: https://www.max-security.com/security-blog/intercommunal-clashes-in-middle-belt-region-grow-to-be-main-source-of-violence-nigeria-analysis/. Thank you.